Historical novels are not my usual choice, but this novel immersed me back in the time of knights and crusaders in the C13th. The protagonist, Rudolph, a young Swiss man is suffering from depression. He believes Satan has claimed his soul and the only way to rid him-self from this dilemma is to travel by horse to the Holy Land where he hopes to end his life fighting for the religion he’s lost touch with. He leaves behind his beautiful fiancé. Rudolph travels with his younger brother, Conrad, who is full of life and hope. Rudolph has much to learn and the story follows his journey of finding himself through living with a hermit, who helps him discover, ’The truth is everywhere yet so difficult to see.’ This time is delightfully told with philosophical questions posed. His return home has surprises in store. Will his fiancé still be waiting for him? Does he want this sort of future? This book looks at life from a depressive’s stance, through to his overcoming this disability. It also looks at the effect of loss and loneliness on other characters in the story. We are left guessing how the story will resolve itself until the last page. Martha Kennedy skillfully writes, whisking us back into a time of long ago. 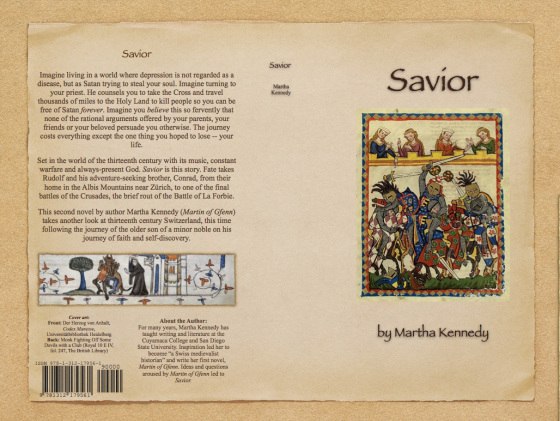 This entry was posted in Book/Film Review and tagged C13th, Good read, knights, long ago, Martha Kennedy, saga, Savior on October 22, 2014 by bkpyett.